Figure 1. Severe white mold in a soybean field. The warm weather over the last several weeks has pushed the Wisconsin soybean crop quickly toward the reproductive growth stages. By the end of the week, most early-planted soybean fields in the southern portion of Wisconsin will begin flowering (R1 growth stage). This growth stage is a critical time to make a fungicide application decision for white mold (Fig. 1; also called Sclerotinia stem rot). Fungicide decisions should be made for this disease between the R1 and the R3 (pods beginning to form on upper nodes) growth stages. After the R4 growth stage control of white mold using fungicides quickly declines. The decision to apply fungicide during this time should be made based on the weather. As discussed in this FACT SHEET and VIDEO, cool (less than 80F) and wet and/or humid conditions during the R1-R3 growth stages can lead to increased risk of white mold later in the season. Figure 2. White mold cycle on soybean. Drawing created by Renée Tesdall. Figure 2 illustrates the white mold cycle. Small hardened black structures called sclerotia survive many years in the soil (Fig. 2A). When conditions are cool and wet during the bloom period small mushroom-like structures called apothecia germinate from the sclerotia (Fig. 2B). The apothecia release spores that land on flower petals and germinate (Fig. 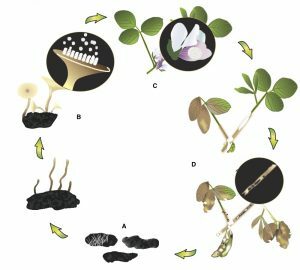 2C) allowing the fungus to infect and colonize the soybean plant. As the fungus continues to colonize the inside of the plant, symptoms will begin to develop around the R5 or R6 soybean growth stages. These include wilting plants and paper bag-brown lesions on stems. Eventually new sclerotia of the fungus begin to develop on the plant (Fig. 2D). These sclerotia become the source for future white mold epidemics. Because the white mold fungus needs the open flowers to infect and colonize soybean, it is important to apply a fungicide during this time to protect the plants from infection IF the weather is conducive for the white mold fungus. It can be difficult to determine what “conducive weather” is and if you need to spray. Figure 3. White Mold Risk Map for Wisconsin on June 30, 2016. White and blue colors indicate low risk. Yellow and red colors indicate moderate to high risk, respectively. In an effort to help define these “conducive” conditions, a model was developed at the University of Wisconsin-Madison in conjunction with Michigan State University to identify at-risk regions which have been experiencing weather favorable for the development of white mold apothecia. This model predicts when apothecia will be present in the field using 30-day averages of maximum temperature, relative humidity, and wind speed. Using virtually available weather data, predictions can be made in most soybean growing regions. Based on these predictions, a map is generated (Fig. 3) to indicate areas at no (white), low (blue), medium (yellow), and high (red) risk levels. 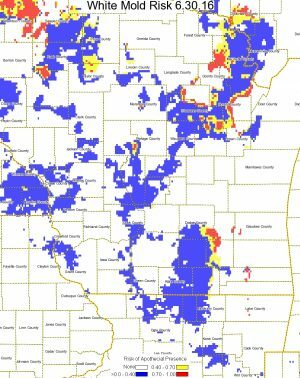 Fields in yellow or red areas have >40% chance of having apothecia present and may be at risk of white mold developing later in the season. Model predictions must be combined with soybean growth stage and canopy characteristics to aid in timing of fungicide sprays. If the model is predicting medium to high risk in your area, the soybeans are flowering, and the canopy is somewhat closed, then the white mold risk is elevated. If your fields are at-risk, we recommend to consult your local extension personnel or resources for the best in-season management options for your area. To view and download a handy user guide for the model, CLICK HERE. 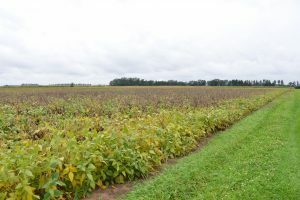 For Wisconsin soybean growers, regular updates and commentary regarding risk of white mold can be found on this blog. Color coded, state-wide maps will be posted and our recommendations will accompany these posts. So be sure to check back regularly or subscribe to the blog to receive an automatic e-mail update when a new post has been added. You can subscribe via the window immediately to the right of this window. The inaugural post for 2016 can be viewed by clicking here. If you have decided to spray soybeans for white mold, what are the best products to use. Over the last several years we have run numerous fungicide efficacy trials in Wisconsin and in conjunction with researchers in other states. Fungicides that have performed well in multi-state studies can be found in the 2016 version of the Soybean Fungicide Efficacy Table. In Wisconsin, we have observed that Endura applied at 8 oz at the R1 growth stage performs well. We have also observed that the fungicide Aproach applied at 9 fl oz at R1 and again at R3 also performs comparably to the Endura treatment. Other fungicide options also include Omega and Proline. You can view results of past fungicide evaluations by CLICKING HERE. For even more detailed information about white mold you can visit the Crop Protection Network page on white mold and also download this handy white mold scouting card. You can also find more information about white mold by clicking here and scrolling down to the white mold section.